Many guitar players struggle to sweep pick cleanly and fast. But for some guitarists, sweep picking is the easiest technique to play on guitar. It’s also not practicing guitar for 8 hours per day. …knowing exactly what to focus on when you practice sweep picking. That's it - that's the whole secret. You too can learn to sweep pick fast & clean, even if you’ve struggled to do so in the past and even if you are just getting started with arpeggios. ...but it’s actually much, much easier than it appears. Reason #1. Your Picking Hand Doesn't Have To Move Fast. Your pick moves a lot slower (and a lot less) when you sweep pick, compared to playing most other guitar techniques. ...and you’ll see that your pick moves a lot more (and a lot faster) to play these techniques compared to sweep picking. To play all 12 notes of this arpeggio… your pick only makes 2 motions. Sweep picking motions are simple to learn, but not always easy to master. Download this free sweep picking eGuide to learn 5 things that help you play all the hard & fast sweep picking licks you want. The middle finger plays just one note on the 10th fret of the second string. The ring finger also only plays one note (on the 11th fret of the fourth string). Another note on the 12th fret of the high E string. Your pinkie finger has a lot of time to move from its first note to its second note in the arpeggio. This means it doesn't have to move fast. And another note on the 9th fret of the first string. Just like the pinkie finger, the index also has a long time between the notes it needs to play. This makes your index finger’s job a lot easier. You see how simple the motions are? In comparison, a simple 2-note trill requires much more work (and faster motions) for your fretting hand than sweep picking does. Most guitarists think that to sweep pick fast, their hands need to move fast. They try to move their hands as fast as possible… and don’t practice the real elements of sweep picking technique. That is why fast & clean sweep picking is hard for them. What are the elements of flawless sweep picking technique? Speed is a byproduct of efficiency. Your pick and fretting hand fingers shouldn’t move any more than they absolutely have to. So, how do you train this skill? Simple - practice each hand’s motions in isolation without using the other hand at all. Spend 5 minutes repeating the motions of some arpeggio with the fretting hand only. Then spend another 5 minutes only practicing the picking hand motion (while muting the strings with the fretting hand). 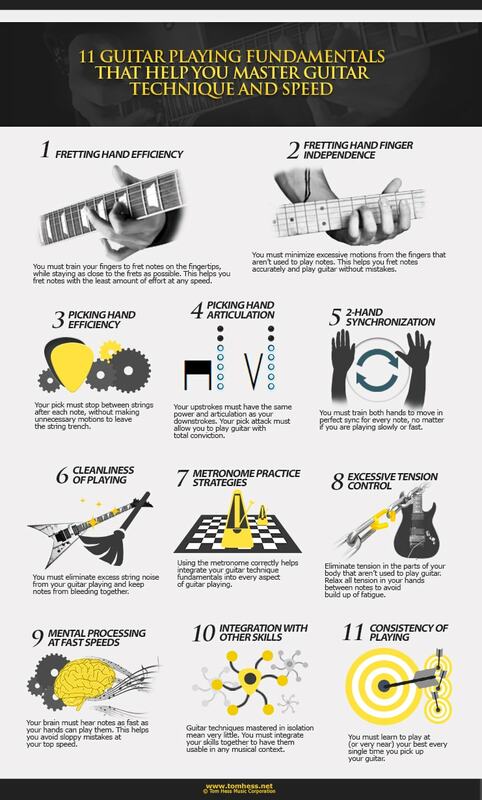 Synchronization is the glue that holds your hands together when you play guitar. When you lack synchronization, one hand often moves a bit slower or faster than the other. This makes your sweep picking very sloppy. Increase your picking hand articulation. This means to make the notes louder. The more powerful your articulation – the tighter your synchronization becomes. You cannot articulate the notes clearly if your hands are not in sync. Use a stiff guitar pick (that doesn't flex when you play). If your pick flexes while playing, it needs to return to its neutral state before each note. This delay disrupts your synchronization. To avoid this, use guitar picks that are at least 1.0 mm thick. What’s the #1 rule of fast sweep picking? It is: NEVER lose the momentum in your picking hand. This means to move the pick in a smooth, continuous motion from one string to the next. Push through the strings in one motion when ascending the arpeggio and pull the hand back in one motion when descending the arpeggio. This is how you reduce the work your picking hand has to do down to two motions. It means playing 2 or more notes on the same fret on different strings, with the same finger. Many guitar players struggle to roll their fingers cleanly across strings. You now know what it takes to sweep pick fast and clean. The next step is to apply your technique to playing killer arpeggio guitar licks. Download this free sweep picking eGuide & learn how to create sweep picking licks you’ll be proud to call your own. Learn to play guitar the way you’ve always wanted from the best online rock guitar teacher.